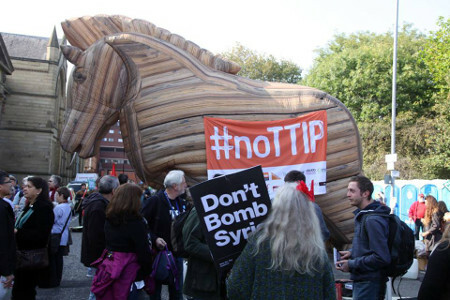 The national stop TTIP campaign and their giant Trojan Horse appeared in Manchester this week to protest against the Transatlantic Trade and Investment Partnership (TTIP), a trade deal currently being negotiated between the USA and the European Union. The international Stop TTIP petition also reached 3 million signatures this week, just one year after it was launched, making it the most successful petition of its kind. A host of familiar faces took to the stage for The People’s Assembly’s special comedy gala at the Manchester Academy entitled ‘Laugh Them Out Of Town’ – with the aim of raising funds for their Week Of Action in response to the Tory Party Conference. 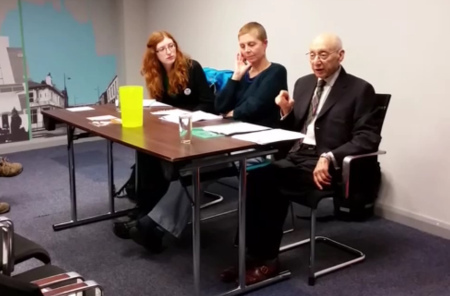 Gerald Kaufman denounces the Devo Manc deal at public meeting in Levenshulme. Gorton South Councillor Julie Reid warns of “privatisation by the back door” and warns of possible mergers between Greater Manchester Colleges. Green party energy spokesperson Andrew Cooper spoke about the pitfalls of the Devo Manc deal, as it currently stands, to a large audience at the Friends Meeting House in Manchester. Around 400 demonstrators joined the national day of action to say “Refugees Welcome Here” in Piccadilly Gardens on Saturday. Around 700 people heard impassioned speeches by actors Maxine Peake and Julie Hesmondhaigh alongside local and national activists on Tuesday, as part of a People’s Assembly meeting around the protest against the Tory Party conference from 4 to 7 October. 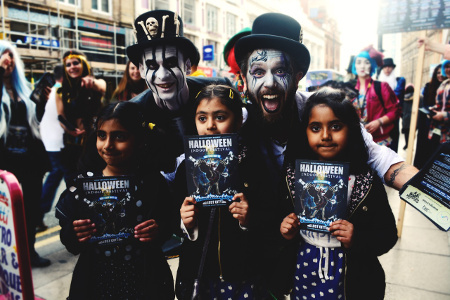 Halloween creatures invade Manchester early: chance to win two tickets to the Illuminaughty Halloween party! A heavy mist suddenly falls on a darkened Manchester hiding from sight unspeakably hideous creatures. Drums can be heard in the distance lulling you into a hypnotic trance, the work of witches and daemons no doubt. Or perhaps Voodoo ring masters, descending onto the city streets armed with psychedelic beats banged out by their armies of musical Goblins possessed with the desire for mischief and fun. It must be that time of year again; it can only be the Illuminaughty Halloween party. Poetry and science are two things generally not associated with each other, in fact if you joined the two in a word association test you would be one step closer to a chemical cosh and your very own padded cell. 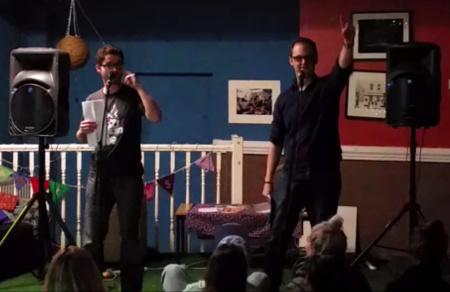 However the audience attending the Science Slam at the packed out Nexus Art Cafe Thursday night will never again doubt the validity of the two pursuits being combined; though I can’t rule out they may end up bouncing of the walls of a padded cell at some time in the future. We were outside Nexus Art Café in the Northern Quarter, queuing, when a car raced up, the driver shoved a woman to the pavement and the performance began. This was the introduction to the character Aggie in A Dream Play by the Déjà Vu Ensemble, daughter of the gods, who has come to our world to learn what it means to be human. This work by Manchester MULE is licensed under a Creative Commons Attribution-ShareAlike 2.0 UK: England & Wales.